So there’s a chili cookoff at my work and I’ve been toying around with the idea of entering it, but wanted to try out a white chili befefore entering. 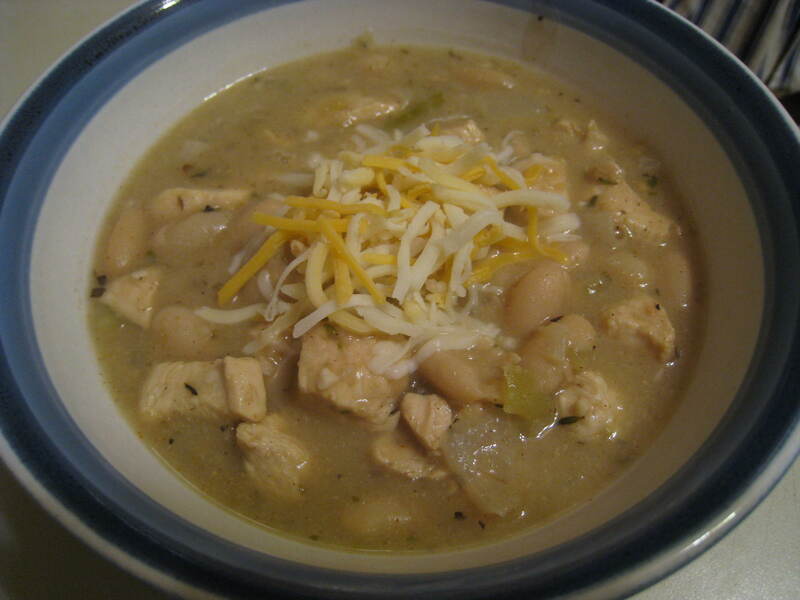 I found a zillion and one recipes for white chili, but finally settled on one from Allrecipes. I modified it slightly and it came out great! I can’t wait for leftovers later this week to see how much more the flavors marry. In a large pot over medium heat, combine the onion, garlic and chicken and saute for 10 minutes, or until chicken is browned. Drain. Add the chile peppers, cumin, oregano, cinnamon, cayenne pepper to taste and pepper to taste and saute for 5 more minutes. Add the two cans of drained and rinsed beans and the chicken broth to the pot. Take the third can of beans (along with the liquid) and puree them in a blender or food processor. Add this to the pot along with the cheese. Stir well and simmer for 10 minutes, allowing the cheese to melt. I added some cornstarch to the chili to thicken up the sauce (2 tsp cornstarch mixed with cold water until smooth and then add to the chili).